Eczema is a common, chronic, non-infectious skin condition. The main symptom of this inflammatory disease is a very itchy rash. It often affects children. In many cases eczema gets better as the years go by, and it may go away for a while or disappear altogether. Acute flare-ups can really affect quality of life. The itching can be especially bad, making it difficult to concentrate and sleep well. Some people are embarrassed if their rash is visible to others. By taking good care of your skin, using medication and avoiding irritants and other things that can trigger the eczema, it is usually possible to relieve the symptoms at least enough to live a fairly normal life. Eczema is sometimes also called "atopic eczema" or "atopic dermatitis." Symptoms of acute eczema include red and itchy skin, sometimes with blisters that easily break and then weep (leak liquid). Over time the skin may become dry and cracked, and also thicken. Its structure may also change, making it rougher. The main symptom is itching, which can often become unbearable. Eczema usually comes and goes in bouts or “flare-ups”: At times it will get worse (flare up) and at other times it will get better. It may also clear up completely for a while. The inflammation is only rarely constant. The areas of skin that are typically affected and the severity of symptoms vary from person to person and also depend on your age. In babies, eczema mainly appears on the cheeks and the outer surfaces of the arms and legs and – less commonly – on the back, tummy and chest. Children, teenagers and adults who have eczema are most commonly affected on the backs of their knees, the insides of their elbows and the back of the neck. The itchy rash may also develop on the palms of their hands and soles of their feet. It rarely affects the face. 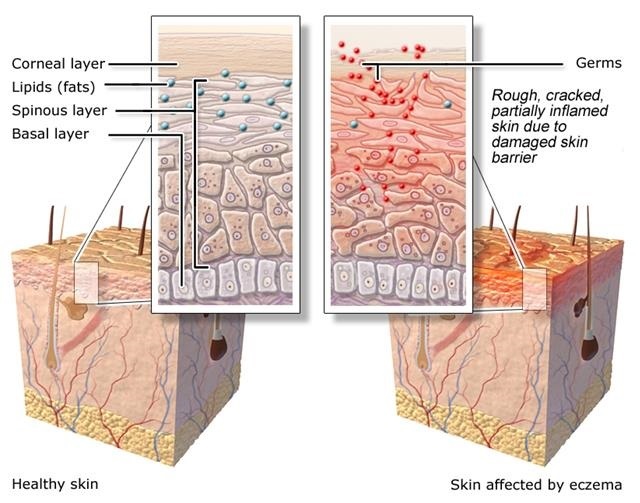 Our skin is made up of an outer layer (epidermis), a middle layer (dermis) and an inner layer (subcutaneous layer). This outer layer has different layers too: the basal layer, the spinous or prickle-cell layer, and the corneal or horny layer (enlarged in the diagram below). The corneal layer – the visible part of the skin – protects the body from germs. It renews itself constantly as new cells grow from the basal layer. In people with eczema, the corneal layer doesn't provide enough protection because it is damaged by the inflammatory response occurring in the skin. Another possible cause is a mutated gene that affects the production of the protein filaggrin, which the body needs to make the skin's outer layer. Because there isn't enough filaggrin, the balance of fats in the skin changes, causing the skin to lose a lot of moisture. The damaged skin also provides less protection from irritants, allergens (substances that can trigger allergies) and germs that might cause infections. Genes play a major role in someone's risk of developing eczema. But other factors have an influence as well. Eczema has become more common in recent years, which makes an explanation based only on genetic factors unlikely. It is thought that pollution and increased hygiene also play a role. This theory is based on the observation that eczema is less common in children who have many siblings or a dog, or who spent time at day care from an early age. It is thought that these children are exposed to germs at an earlier age and that this helps train their immune system. Vaccines are sometimes associated with eczema in children. But analyses of studies on the effect of vaccines haven't found a link here. There is currently no scientific reason to believe that they cause eczema. It is even a good idea to vaccinate a child who has eczema because illnesses such as chickenpox can become more severe in someone who already has eczema. About 15% of children have eczema, but it only occurs in 2-4% of adults. Adults with eczema often have a more severe type. 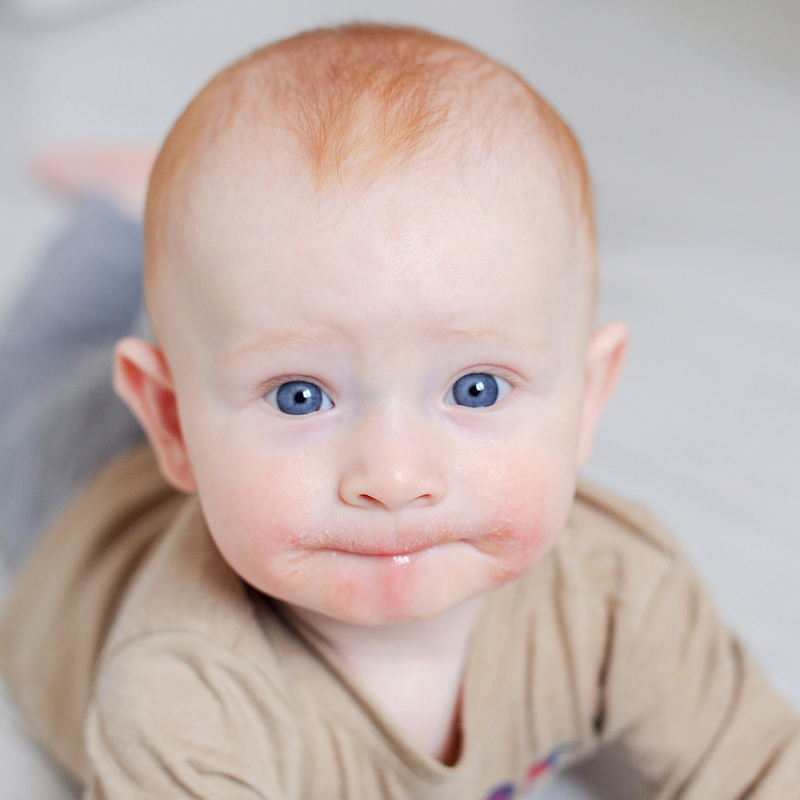 Eczema usually starts during the first two years of life – typically between a baby's third and sixth month. Some children also develop eczema later, but it is quite rare for eczema to develop after the age of five years. A rash starting on a baby's scalp (sometimes called "cradle cap") may be an early sign, but it doesn't necessarily mean that the child will develop eczema. The further course of eczema depends on the age at which it develops, among other factors. Children who develop eczema under the age of twelve months often grow out of it relatively quickly: Only half of them will still have it after three years. Eczema is often more persistent in children who develop it between the ages of two and five years. It is estimated that eczema goes away again within ten years in more than 80% of all affected children, and within 20 years in up to 95%. Eczema returns in some adults, particularly on the hands. It is rare for people to first get the disease in adulthood. Eczema in adults is usually chronic, with phases of more and less severe symptoms. A type of bacteria called Staphylococcus aureus sometimes causes an infection in those areas of skin affected by eczema. These bacteria can also be found on the skin of people who don't have eczema. They are usually harmless. But if they cause an infection, they can make eczema worse. Bacterial infections are characterized by redness, weeping and/or the formation of yellow crusts. If the infection spreads, it will usually have to be treated with antibiotics. Inflamed, cracked skin also makes it easier for herpes viruses to spread. Herpes infections usually affect the face. Small blisters filled with clear fluid form and then burst a short time later. The blisters leave behind small dot-like crusts. The skin can become very sore and there may also be other symptoms like fever or tiredness. It is important to see a doctor quickly if a herpes infection spreads to other areas of skin. Scratching is a natural reaction to itching, but it can make complications more likely and the itching worse. Most people who have eczema know not to scratch because it can leave superficial wounds on the skin that may become infected. But this is easier said than done. So there is no need to feel guilty if you do end up scratching your skin once in a while. Keeping children's nails cut short can help to keep them from scratching too much. Allergic eczema may be associated with hay fever or asthma. About one third of all children who have eczema also develop asthma or hay fever by the time they turn five. But it is not yet known exactly how these conditions are related. Eczema is diagnosed by doing a physical exam. If you have an itchy rash on the parts of your body that are typical for eczema in a person of your age, and it lasts or keeps coming back for several months, a doctor will diagnose you with eczema. Other possible conditions such as psoriasis will be ruled out at the same time. Eczema is sometimes confused with seborrheic dermatitis, especially in infants, but that condition is hardly itchy and clears up on its own after a few months or weeks. If someone is believed to have allergic eczema, an allergy test may be done – either by testing their blood or doing a skin-prick test. The blood is tested for specific antibodies that the body produces in response to allergens. If the test results are normal, it is quite certain that the person doesn't have an allergy. Abnormal results are more difficult to interpret: They confirm that the body is overly sensitive but don't say anything about whether this reaction or the severity of the symptoms have anything to do with the eczema. That is why it is important to, for instance, use what is called a "challenge" test to find out whether the skin actually reacts to the allergen. Under a doctor's supervision you consume a food that may possibly trigger an allergy to see how your body reacts. Because these allergy tests are of limited usefulness, it isn't a good idea to test for all different kinds of substances without good reason to believe that they might be affecting your eczema. Eczema: Can eliminating particular foods help? The risk of developing eczema is mostly hereditary. Studies haven't shown that anything can effectively prevent it. Research so far suggests that only dietary supplements containing probiotic bacteria might have a preventive effect. Breastfeeding possibly lowers the risk of eczema somewhat. But the research results are not clear. It is never really possible to say exactly why a child has developed eczema because there are so many different factors involved. Also, the causes of this skin condition are not completely understood. Despite this uncertainty, the World Health Organization (WHO) recommends that women fully breastfeed their babies for the first six months of their life and then offer them both solid foods and breast milk. This is because breastfeeding strengthens the bond between mother and child and offers other health benefits for babies: For example, it lowers the risk of some infectious diseases. Eczema in children: Can prebiotics or probiotics help prevent it? What effect does diet during pregnancy or breastfeeding have on a child's risk of developing eczema? Steroid creams: Eczema flare-ups are usually treated with steroid creams because they can relieve the itching and inflammation. They are typically used only for acute symptoms. But they are sometimes used at regular intervals together with moisturizing skin care products (basic treatment): for example, as a "weekend treatment" where a steroid cream is applied on one or two days a week. Pimecrolimus and tacrolimus: Pimecrolimus and tacrolimus are two other medicines that can be used to treat eczema. They are not approved for use in children under the age of two years, though. These two medicines are also applied to the skin in a cream or ointment, and can be used if steroid products are not an option. This might be the case if steroid treatment is not tolerated or is ineffective. Pimecrolimus and tacrolimus may also be an option for long-term treatment of sensitive skin in the face and neck area. They can also be used on one or two days per week only, as described above. Other eczema treatment options include wet wraps, UV radiation and medications that suppress certain immune responses. Tablets containing these medicines are used if other treatments don't work, or if the eczema is very severe or affects large areas of skin. Because they have an effect throughout the entire body, they may have more extensive side effects than topical treatments. Allergy medications (antihistamines) are also commonly used to relieve itching. But research has now shown that they are not suitable for treating eczema, whether used as tablets or a cream. People often try out herbal products or dietary supplements, such as evening primrose oil, borage oil, vitamin B6, vitamin E and zinc. But research hasn't shown that these products are effective. Many other treatments such as laser therapies or hyposensitization have not yet been studied enough, so they are not recommended by medical associations. A lot of people – including doctors – do not understand how much of an impact eczema can have on someone’s life. You need to be patient to deal with the daily challenges associated with eczema and to find the right treatment for you. But many people end up coping well with eczema. It can also be hard on children, and some days will be testing for both parents and the child. But phases of severe symptoms are usually followed by milder phases. And the odds are that, as children grow up, their eczema will improve on its own or even disappear altogether. Parents who have a child with eczema may feel unable to cope and helpless from time to time. Worries about your child, keeping up the skin care routine, countless visits to the doctor and sleepless nights can be a great burden. Special eczema education courses have been developed to help parents, children and teenagers. The courses provide information on the treatment options and ways to avoid irritants. They also offer tips on coping with eczema in everyday life. In Germany, these courses typically involve a total of six two-hour sessions held on a weekly basis. The costs are covered by many of the health insurers in Germany. Parents and children often feel discouraged by how others react to eczema. Some people are unfamiliar with the disease so misunderstandings may easily happen: for instance, others might think it's contagious or that the child's parents have been neglecting him or her. Sometimes parents try to avoid these kinds of situations by no longer going out much with their child. Others find it more helpful to address possible misunderstandings and stereotypes by talking about the condition and its effects. Self-help groups are one way to share your experiences with other parents in similar situations. There are many sources of support in Germany for people with eczema, including self-help groups and information centers. But many of these facilities are organized quite differently. Our list can help you find and make use of local services in Germany. Deutsche Dermatologische Gesellschaft e.V. (DDG). Neurodermitis. S2k-Leitlinie. March 2015 (AWMF-Leitlinien; Volume 013 - 027). National Institute for Health and Care Excellence (NICE). Atopic eczema in under 12s: diagnosis and management. December 2007. (NICE Guidelines; Volume 57).